I’ve been thinking about chairs recently. I’m not sure why, but it’s something that happens to me from time to time. Over the years I’ve dabbled in chair construction here and there. Sometimes successfully, and sometimes not so successfully (like the chair in the photo below). Peter Follansbee recently wrote a post about them too, so maybe it’s something in the air. Who knows, but I’m back on a chair kick at the moment. A failed attempt at a post and rung rocking chair. 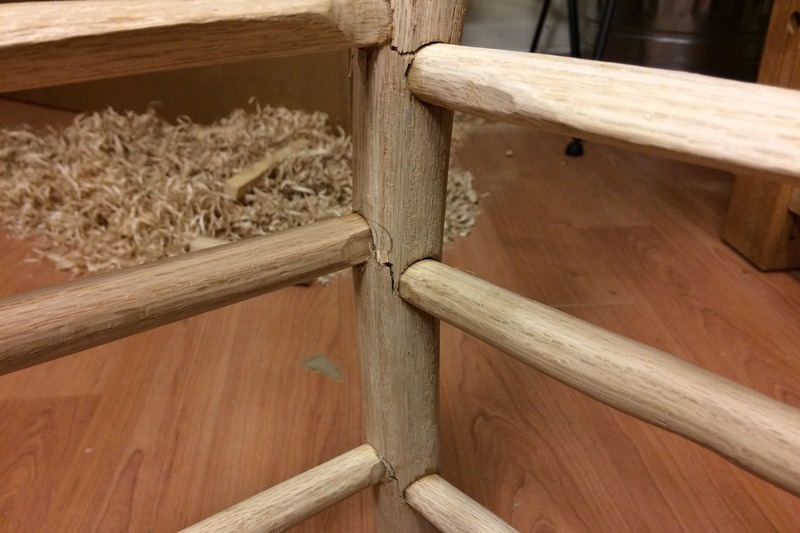 The last time I attempted to make a chair, things didn’t go so well. The wood that I used came from a suburban back yard (our old house). I split the parts out of the tree and started working on them, but then some things came up and it was awhile before I got back to it. When I finally did get around to starting to frame up the chair, disaster struck. This slow grown backyard oak was not going to cooperate. I can’t say for sure what caused the massive failure in the posts of this chair, but my guess is that it was a combination of things. First, I had probably let the wood dry for too long. The tree was cut down in the summer of 2013 and split up and started then, but the parts were left to dry until almost 2 years later. It also had a few bug holes, so bug damage can’t be ruled out either. Finally, the way that the posts broke shows signs of brashness. Being a suburban backyard tree, it was quite slow growing – not the best tree for this kind of work. So signs point to the wood itself not something I did. Nonetheless, I’m itching to go to work on another chair. I’ve been thinking a lot about Welsh stick chairs though. Maybe because I’ve been going back through Drew Langsner’s book The Chairmaker’s Workshop recently? I don’t really know why, but the simpler form of the Welsh stick chairs really seems to speak to me lately. Years ago, I was all about high style period furniture and Windsors with baluster style turned legs. But I found that while I liked the challenge of building the fancy stuff, we never really kept most of it in our house, because it really just wasn’t our style. Now that we’re building a log cabin on our new farm, fancy, high style stuff, even Windsor chairs, really don’t fit with the aesthetic we’re after. So I recently ordered Don Weber’s DVD on building a Welsh stick chair. I’ve always liked Don Weber’s style and persona. The first time I met him was at Woodworking in America during one of the event’s early years. After chatting with him for a brief while, I knew he was just one of those guys that didn’t take himself too seriously but definitely took his craft seriously, and absolutely loved what he was doing. So I felt like his DVD would be a good addition to Drew’s book. I wasn’t disappointed. The DVD is over 3 1/2 hours long, so I watched it over two evenings last week. It just made me want to build one even more. So I think a walk through my woods is in order for the weekend to see if there is a decent oak that I can take down before the sap starts to come up. We’ve got 10 acres of mixed pine & hardwoods, so I’m sure I can find something suitable. Posted in Project Logs and tagged post and rung chair, Welsh stick chair. Hey! It still looks good! 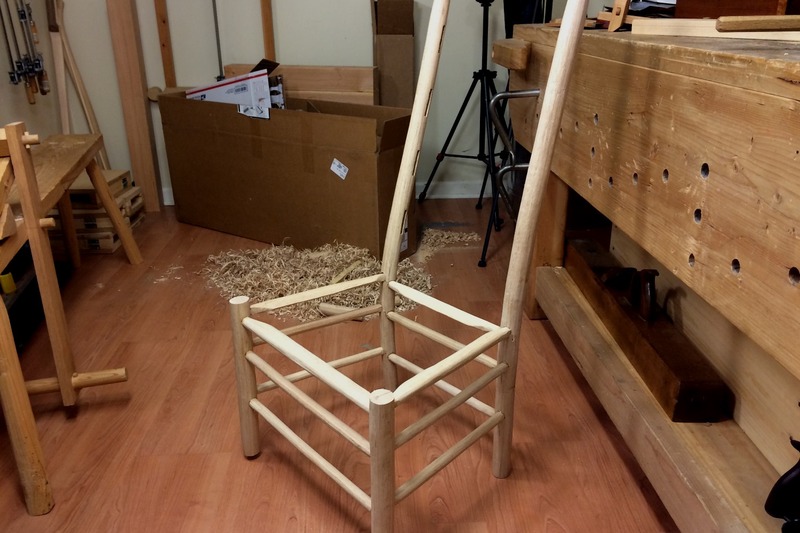 I want to try my hand at making Welsh Stick Chair, too. I will be interested in how you do with the new DVD. I have Mike Abbott’s Going with the Grain. I haven’t made a chair from it yet, but it tells you everything you need to get going.